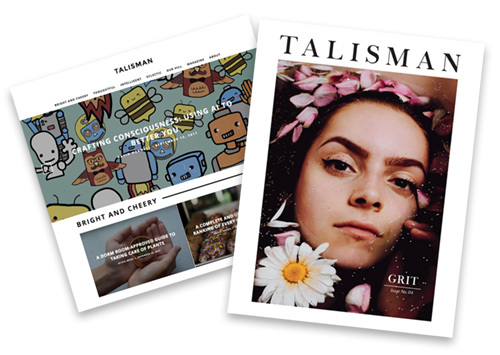 Talisman, WKU’s student-run life, culture and news magazine and website, has been awarded a Gold Crown from the Columbia Scholastic Press Association. One of the top awards for student media, the hybrid Gold Crown recognizes both the Talisman magazine and website. The honor was the 10th time Talisman has been awarded the Gold Crown by CSPA, based at Columbia University in New York City. First published as a yearbook in 1924, Talisman transitioned to a magazine in 2016 and has received a Gold Crown each of its first two years in the new format. The Talisman website is updated daily with an eclectic mix of stories, photos, essays, videos and more. The next issue of Talisman magazine will be released May 1. The Gold Crown honors work published during the 2017-2018 academic year. The editor-in-chief was Helen Gibson, a graduate from Cadiz, who is now a content and marketing communications fellow at Q Ideas in Franklin, Tennessee. The other members of the Talisman editorial board were 2018 graduates Rachael Doyel and Emily Johns of Bowling Green, Hannah McCarthy of Nashville, Jessica Voorhees of Edgewood, and Sophie Whorf of Crestwood; December 2017 graduate Hunter Frint of Bowling Green; Alexandria senior Hannah Good; Nashville senior Evan Mattingly; and Nolensville, Tennessee, junior Emily Moses. During the 2017-2018 academic year, 72 students representing 28 academic majors from every college at WKU worked on Talisman. Since 2002, an average of 92.6 percent of freshmen who have worked on Talisman have remained enrolled at WKU for their sophomore year, and among the 2012 cohort of WKU freshmen, 88.9 percent who worked on Talisman at some point during their college career graduated within six years. During Crown consideration, publications are judged on their excellence as shown by their design, photography, concept, coverage and writing. A total of 1,172 publications were eligible for judging. For more information, contact Talisman Adviser Sam Oldenburg at samual.oldenburg@wku.edu or 270-745-3055.